BAKIBAKI from DOPPEL "LIVE PAINT"
YOUBOB from backroom "LIVE PAINT"
He makes full use of his 11 faces and 1000 arms to continue to be the beacon of peace and revolution, from his underground performances in Japan. His riddim to be combined with his open minded instruments that build-up upon, the Super heavyweight bass that goes back and forth with the whole body, with dub effects that of a beast, letting the floor dance madly with joy. He is a Dub. Jungle. Downtempo and Japan CLUB music pioneer who has been the undisputed leader in the genres for the past 22 years. He has performed at over 2000 gigs, and has organized more than 500 Dances until now. He has organized w famous and important Dance in Japan "Zettai-Mu" began in 1995 (Bay Side Jenny, Namura Shipbuilding, Noon, Liquidroom, Unit, Yellow, Eleven, AIR, Rockets, Motherhall, Quatro, Circus, Open Air and more) and then "Outlook Festival Japan" (ageHa Studio Coast, Sound Museum Vision and more) "Exodus Island " "A Taste Of Sonar (its first time in Asia Sonar Festival)" "International Dub Gathering Jahpan" as well. He performs about 100 gigs a 1 year for more than 20 years, and tour pilgrimages more than 50 times including Japan, Asia, UK, Europe , British London, Spain "International Dub Gathering" Croat "Outlook Festival" and then active in the Asian countries including Beijing, Shanghai, Hong Kong, Korea, Taiwan, the Philippines, Vietnam, Thailand etc in recent years. and also He did use Sound System for Jungle Dub step music first time in japan. Kuranaka (a.k.a 1945) also has been hugely successful with festival appearances throughout Japan, such as the Fuji Rock Festival, Rainbow 2000, Asagiri jam, Metamorphose, Earth Dance, Saturn, Dommune, Nagisa, Mai Music Festival , Outlook Festival and Sonar Festival. such as art museums (Yokohama Art Museum , Kyoto Municipal Museum of Art , London ICA etc), the Valley and Seaside, the gap of the Building and the top of the Desk, and the close to Your ears. Kuranaka has also toured Japan with Dub Reggaes such as Lee perry, Jah shaka , Aba shanti-i , Mad professor , Zion Train , Adrian Sherwood , Dennis Bovell etc. then Drum and Bass / Jungles such as Roni size Reprazent, Congo Natty, Shy fx, Andy C and many. More then he play with Daftpunk , James Blake , Darren Emarson Underworld , Ash Ra Tempel , Atari Teenage Riot and many more in First visit japan show. he also Performed Flyng Lotus , Battles , The Orb , Smith&Mighty , Cold cut Ninja Tune etc. 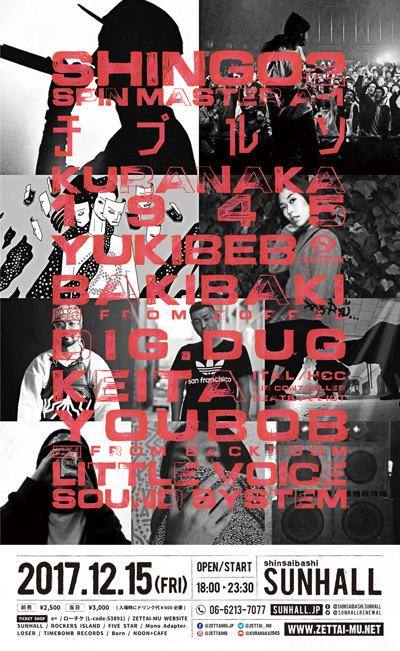 ofcouse he also with Japanese Acts such as Boredoms, Dj Krush , Audio Active , Tha Blue Herb , Dry&Heavy , Oki dub ainu , Goma , Goth-trad and many more. He perform live set with "Kazufumi Kodama" of Japanese reggae originator from Mute Beat. also Didgeridoo player "Goma" and then The controversial product "the Constitution of Japan" developed by a combination with "Shing02" for two International Art Festival (Yokohama Triennale, Kyoto Parasophia) It was created and released for one year. He also creates and plays music with Heavy (Dry&Heavy, Rebel Familia), Ao (Dry&heavy), Goma (didgeridoo), Coba (Accordion), NHK Koyxen, E-da（ex.Boredoms), Iccihie (ex.Determinations) , Tokona-x etc. He released (suchas) DJ Spooky , DJ Vadim also The Bug as the name of “MOU”, which is the pioneer Future Beat Music “Electlic Lady Land” from the well-known German’s “Mille PlateauxI” Moreover, as the name of “Kuranaka”, he attended compilation of “Kyogen” with Calm, Shing02 and so on. Furthermore, as the name of “1945”, he released featuring alongside ex-Dry&Heavy’s bassist, "Akimoto Heavy Takeshi". also released Mixs called “TIGHT” from “Entotsu Recordings”. He(and his Live CDs) amassed the sold out sales including all the titles. As a remixer, he sends deep world, dissembles and reconstructs masterpieces done by On-U Sound (UK) Audio Active , Rebel Familia, Original Love, Jun-Gold (Tha Blue Herb Recordings) and so on. The strong beats with the message is down to earth and very sensitive but mighty sense of “Past”, “Now”, and “Future”. We are fighting against the monsters of our own creation. Remember 1945, Peace one love Harmonic future !! Japanese written "クラナカ" also his name in long time ago. and then "The Kaoss Pad" used habitually all over the world is.. Delay, Reverbe, Siren.. It was developed by him. and the his model "Siren Machine" thats using Mala (Digital Mystikz) also The Bug etc. The message carried out from his strong beat, reaches those of whom both legs are grounded to our earth, is delicate, yet, powerful.. the 21st century taiko drummer, waves his flag to peace and love for a harmonic future. Somewhere, now today. Tokyo native, Yukibeb, started posting her mixes on Soundcloud in 2011 and soon quickly amassed global attention for the eclectic vibes and moods she conveys through her selections. She doesn’t really care for hype, follows her strong intuition and instincts to curate her one-of-a-kind sound. Both intimate and sensual, the sounds she fuses represent her hip hop, future beats, and R&B sensibilities. The diaphanous soundscapes she creates for her hungry listeners reflect the intricate sounds that compliment the complex and fluorescent backdrop of the Tokyo underground.